A Japanese female revenge story, sounds really intriguing indeed! Good stuff! I have this film on a watchlist of mine and I'm really anxious to see it. Shamefully I had never heard of it until accidentally running across it online. @ruth-Oh, you will love it. It's got a strange sense of beauty in the way the violence is presented. @keith71_98-I thank Quentin Tarantino for this. He was partially inspired by that film for Kill Bill and did a homage to it in the film's climax for the first film. I heard about this film when I saw Tarantino discuss how it influenced Kill Bill. Now I really want to see it. 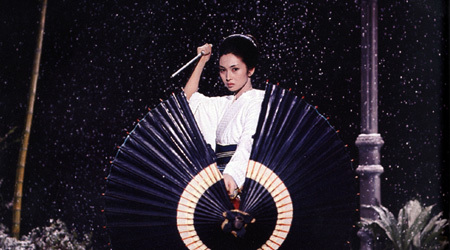 My what intense eyes Meiko Kaji has! @vinnieh-See it. It was on TCM recently although I'm not sure when it's coming back. If you have some money to blow for the next Criterion sale. Get the entire film set.